Want an exercise machine that will help you lose weight and burn fat as well as take up a small amount of space? Don’t have too much money to spend on exercise equipment, but need something? Turned off by the high prices of other gym equipment on the market? Don’t give up until you’ve checked out the Stamina In-Motion Elliptical Trainer. The Stamina In-Motion E1000 Elliptical Trainer is a piece of home gym equipment that allows users to benefit from elliptical training without investing in a large, space consuming elliptical machine. This mini version of the elliptical features a compact, sturdy design, is extremely lightweight and offers a variety of training options to maximize results. It is certainly one piece of equipment that will get a lot of use due to its ease of use and versatility. Although it does not compare to a full size elliptical, this compact version is able to strengthen the cardiovascular system and tone the lower body. The best part is, it is available for under $100. Let’s take an in depth look at the Stamina In-Motion Elliptical Trainer including its benefits and drawbacks. One great aspect of the Stamina In-Motion Elliptical trainer is how easy it is to assemble. Assembly literally takes minutes and then you are ready to train. Once the three step assembly process is complete you will notice all the nice attributes that contribute to both the design and functionality of the elliptical trainer. The first thing you’ll notice is its lightweight yet sturdy design. The trainer is constructed from rust-resistant steel. It also has non-skid pedals for safety which are attached to a crank mechanism that allows the pedals to move both forwards and backwards. The elliptical also has an LCD workout tracking monitor that displays basic statistics including session duration, calories burned, strides per minute and total number of strides for easy workout tracking. It is powered by one LR44 battery supplied by the manufacturer. There is also a tension knob located directly below the electronic display to control the level of resistance. Turn the knob clockwise for more resistance and counterclockwise to reduce the resistance. As displayed by the product specs, the Stamina in Motion Elliptical Trainer requires very little space and is under 25 lbs. making storage a breeze. It can be placed in a corner of a home gym, a closet, under a desk or any other small space used for storage. The steel frame makes this piece of exercise equipment solid and durable while the adjustable resistance levels offer good range along with the stride length options. The 10-15 inch stride length is more than satisfactory for such a compact elliptical. The Stamina In-Motion Elliptical Trainer delivers an effective cardiovascular workout that also activates major muscle groups while preventing injury to the joints. It does this by mimicking the natural movement of the joints. The effectiveness of this trainer is largely due to the resistance levels. 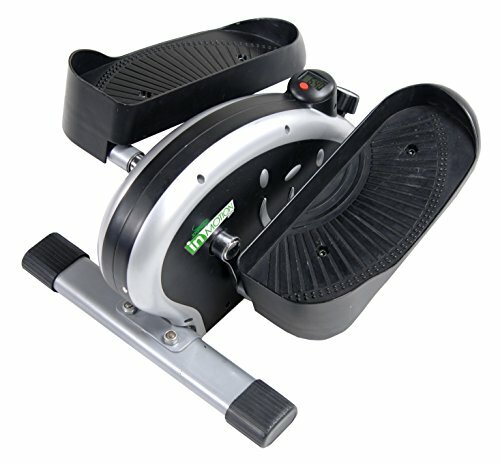 Users are able to work at a range of intensities with this elliptical trainer due to the different levels of tension. When the body is working against added resistance it exerts more force. This exertion of force causes many physiological responses including an increase in heart rate as well as blood flow to muscle tissues. Heart rate is at the center of cardiovascular exercise and the Stamina In-Motion trainer is more than capable of increasing that number significantly. In fact, users are able to train within the first 3 heart rate training zones, more or less, meaning 50-80% MHR (max heart rate). Aside from delivering an impactful workout, the Stamina In-Motion Elliptical Trainer is an extremely versatile piece of home gym equipment and makes exercise convenient. Not only is there the option of using the elliptical in the standing position but the trainer can be used while sitting. Whether users are working at a desk, watching television or sitting down and reading a magazine, they can pedal away and get a great workout in the process. Another plus is the trainer’s performance. The elliptical is smooth and glides easily while the LCD display does an excellent job at tracking progress during workout sessions. The monitor display is very simple and does what it is intended to do. It also self-pauses so if you decide to take a rest during training it will pause and resume once you return to provide an accurate measure. Adjusting the resistance is easy to do as well. Tension can be controlled with a turn of the knob. Some consider the small base of the elliptical a drawback but it adds stability training to each session done standing up. Having to stabilize yourself on the trainer engages and strengthens the core and also targets the abdominal muscles. For some, this may take time to adjust to but once you get used to the trainer, it is very easy to use even when taking faster, more intense strides against more resistance. Like all products on the market there are drawbacks. For starters, the Stamina In-Motion Elliptical Trainer is small. Its compact design may require an adjustment period. A portion of individuals who have used the trainer have complained that it can be unsteady at times and feels as if it may tip. Another drawback is the shorter stride options. Some individuals find the stride lengths to be shorter than they would like. As stated previously, these drawbacks are a direct result of the elliptical trainer’s dimensions. The Stamina In-Motion Elliptical Trainer is a cost effective piece of home gym equipment that everyone can benefit from. The E1000 is an impressive, space saving trainer constructed from quality steel that includes key features expected from an elliptical including non-skid pedals and a workout monitor. It provides users with a range of exercise options and is a great alternative to a full size elliptical. Integrating it into a fitness plan is easy and the trainer will help users condition their cardiovascular system, strengthen the lower body and activate the core. It is a smart buy for anyone who enjoys exercising at home. Overall, the Stamina In-Motion Elliptical Trainer is a great investment for under $100 and will give you the workout you’ve been striving for. If you work in an office and can’t seem to find the time to be active, this machine is perfect for you. Quieter than a fan, it doesn’t attract attention and can easily be slipped under a desk and used while working. You can easily get a great lower body workout while at work and for a great price. the Stamina In-Motion Elliptical Trainer is a great investment for under $100 and will give you the workout you’ve been striving for. The main thing I like out this trainer is that its light and compact. This machine can be used anywhere and can be moved from place to place with ease. It emits hardly any sound while in use, proving to be a great piece of workout equipment for small houses, offices, or apartments with thin walls and floors. For the low price, it gives you a great lower body workout that can help tone your legs and strengthen your core. This small piece of equipment provides two pedals that will help you workout your lower body while also helping you train and perfect your sense of balance. With two non-slip pedals, this machine is ready to help you start losing weight and feeling great. If you want to work out your lower body, but don’t want to spend all the money for a huge elliptical, the Stamina In-Motion Elliptical Trainer is the perfect machine for you. At just $89.99, this lower body workout machine will exercise your lower body for a decent price.